Gertrude Mitchell Bell (left) and Anne Bowly Maxfield were happy to see each other for a lunchtime get-together. Photo by Laurence Kesterson. 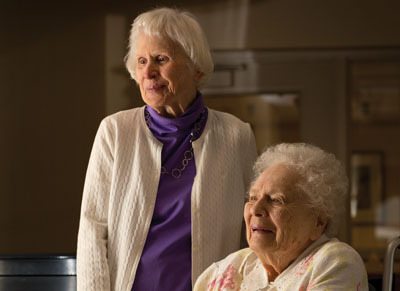 Anne Bowly Maxfield and Gertrude “Trudy” Bell, graduates of the Class of 1934, have been friends for 80 years. Although understandably less physically fit and nimble than in their college days, their memories are remarkable, their demeanor playful, and their humor infectious. They are both quite beautiful. And they are both 100 years old. Anne and Trudy were members of what Anne described as a “Depression” class. “We were lucky to be in college, which was a pretty ivory-towered existence then,” Anne wrote in a 1994 reunion questionnaire. This fall, the two centenarians and their daughters—Betsy Maxfield Crofts ’63 and Barbara Bell Seely ’67, who served very nicely as prompters—spent an hour reminiscing at Pennswood Village, a retirement community in idyllic Bucks County, Pa., where Anne lives. Trudy lives in Blue Bell, Pa.
“College fees at the time were $900 plus $50 for books,” Anne said. 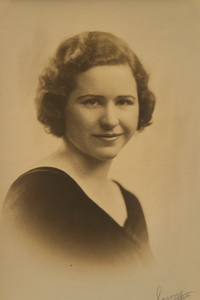 “Some students held down jobs and lived at home to finance their Swarthmore education.” H. Craig Bell ’34, the young man Trudy later married, now deceased, was one of them. Gertrude Mitchell Bell’s Halcyon portrait. Of course, the College has changed dramatically since Anne and Trudy were students. But of the 59 buildings on campus today, 24 existed when they were students, notably the College Building (now Parrish Hall), where meals were served in the space currently occupied by the student lounge and the post office); the Science Building (now Trotter Hall); Sproul Observatory; Hicks, Papazian, and Wharton halls; Mary Lyon’s four original buildings; Bond Hall and the Lodges; Fraternity Row; and Worth Hall, where all senior women lived. Trudy, an English literature major interested in political science, reminisced about a new young English professor, who, in his first year of teaching, was chronically late to class. “We’d been told that if a professor didn’t come after a certain length of time—five minutes or so—we could leave,” she said. “So we sat and watched the clock, then as soon as the time had passed, we rushed out of the classroom,” she added gleefully. Unlike today, all finals examiners—not only those for honors students—came from outside the College, Anne and Trudy said. “I almost didn’t graduate,” Trudy joked. “My examiner asked a question that I couldn’t answer, then I remembered I’d done some outside reading and realized that was what the question was about,” she laughed, going on to explain that as a graduate of George School—a well-known Quaker high school in Bucks County, hundreds of whose graduates have populated the Swarthmore campus—she received automatic admittance to the College, while Anne applied through normal channels. 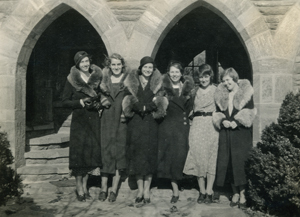 Smiling and handsomely clad, ladies from the 1930s, including Anne Bowly Maxfield (third from right), pose in front of the College cloister. “Anne got As, though,” Trudy said. “I never got an A in my life,” she added, eliciting a chuckle. “I did get As, but that was because my mother was a teacher,” Anne countered modestly. “We weren’t athletic, were we?” Trudy asked her friend. “Oh, no, but we all had to take field hockey as freshmen,” Anne replied. Both said they liked the sport but were not good at it. Anne enjoyed organizing, so had little time to “be social,” she said. Involved in activities such as managing the swim team (“I didn’t swim, though; I just managed.”), she also oversaw the campuswide distribution of The Phoenix and was a member of the Halcyon staff, the French Club, and GWIMP, an athletics managers’ society for women’s sports, whose male counterpart was KWINK. Both women were members of Phi Mu, one of several campus sororities and fraternities. “One of the best things about being in a sorority,” Trudy said, “was that if a girl met a boy she liked, she could invite him to a dance.” This was how she met Craig Bell. “I asked Craig to a sorority dance and then to a Phi Mu weekend outing to the New Jersey shore that the sorority had organized. Later, I married him,” Trudy said. On the whole, College romance was not so very different from today. Most students had little money to spend so looked for inexpensive ways to have fun. 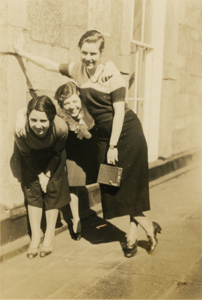 Anne Bowly Maxfield ’34 takes a break with her two friends Marcia Lamond Moxey ’33 and Marion Hirst ’34. Although sorority life was fun, both Anne and Trudy felt bad for those young women who were interviewed for membership but not selected, which, Anne said, was the reason that she was instrumental in their being abolished, along with Molly Yard ’33, a feminist activist who later served as president of the National Organization for Women. “Abolishing the sororities was a major event,” Anne added. After graduation, followed by a secretarial course for Anne and a master’s in library science for Trudy, they worked: Trudy as a librarian and Anne as a secretary at George School, where she met her future husband William as well as “Jim” Michener ’29, a teacher there at the time. In her reunion notes on life at Swarthmore, Anne, who served as class secretary from 1985 to 2007, wrote: “We produced at least two college presidents, [James Perkins and T. Noel Stern]; at least two peace activists as well as a top-notch designer and executive for Boeing, doctors, professors, teachers, coaches, librarians, social workers, homemakers, bankers, lawyers, public relations consultants, business executives, authors, at least one exhibited artist, a television producer and executive, and many community volunteers. “We were a productive class, no doubt privileged and fortunate, but a good group,” Anne said. Note: The staff of the Bulletin is saddened to report the Dec. 23 death of Anne Bowly Maxfield. We feel privileged to have been able to witness her wit, wisdom, and wonderful smile during our interview in October. What a lovely article. Anne's daughter Betsy was my Swarthmore room-mate and her family took me in during short vacations. Anne and Bill were wonderful to me all 4 years. Amazing that Anne is 100 before I learn what a truly impressive Swarthmore student she was.